You Say – Not My Horse!! But, then.... there was this horse in your memory that almost died. 'Wake Up Horse Owners'! IT CAN and WILL happen to you (or someone you know)! Part 1: Understanding how horses survived climate change from rain forest to dry grassland and adapted. A horse may have digestive problems by simple acts of severe weather change, change in their routine or an abrupt change in the feed source; ranging from impactions, diarrhea, upset stomach, refusing feed or not eating up. Did you ever wonder, why? There is actually a really good explanation that scientists have researched; after analyzing fossil data alongside of records of North American climate changes. The researchers found that the animals diets shifted from rain forest fruits and leafy vegetables to the more abrasive diets found in grasslands. When horses first came into being, they were located in a rain forest type environment of vegetables, fruits and lush leafy greens. This would be like you eating a large veggie salad. As time passed on, the land went through a climate change from being a rain forest to a dry climate where the same vegetation would not grow. Only a dry grass land came into existence. The horses were faced with becoming extinct if they did not adapt to the environment. Can you imagine if you changed today from eating a nice supple leafy veggie salad, to eating grass on your lawn or even dry hay? Your body and the horses were not designed to break down those fiber roughages for food source. In nature the horses adapted to their environment which was a successful survival strategy. The ancient ancestors of Equidae (The horse family) developed the ability to digest the dry climate vegetation grasses. Eating grass, which is a difficult to digest, was a successful survival strategy. During this period many species were unable to adapt to eating grasses and became extinct. However this survival strategy came with a price. Horses are non-ruminant herbivores of a type known as a "hind-gut fermenter." This means that horses have a simple stomach, just like us. However, unlike humans, they also have the ability to digest plant fiber (largely cellulose) that comes from grass and hay. They differ from ruminants (cattle, sheep and deer), which digest fiber in plant matter by use of bacteria in complex multi-chambered stomach to digest fiber by fermentation and use enzymatic digestion in the small intestines; a far more efficient digestive system. Horses developed, because of means of survival, a delicate but unique dual system. The fore gut is where digestion of simple carbohydrate sources such as starch from grain occurs. In the hind gut is where the fibrous sources such as oat hulls, beet pulp and hay occur. Foregut consists of: esophagus, stomach, small intestine and cecum. Hindgut consists of: cecum and colon. Digestion is by microbial enzymatic fermentation and takes place in the fore gut ahead of the cecum; the crude protein digestion and virtually all soluble carbohydrate digestion. At this time the fiber is not broken down and moves on through the digestive tract. Where broken down later by the fermentation vat called the Cecum and then absorbed in the colon. The horses have adapted to breaking down fibers, but they are not a ruminant type animal like the cow. They are classified as non-ruminant. That is why they need to be watched carefully to avoid deadly complications. On April 15th Part 2 We will explore the horse's digestive tract. We will following the feed through, from start to finish. 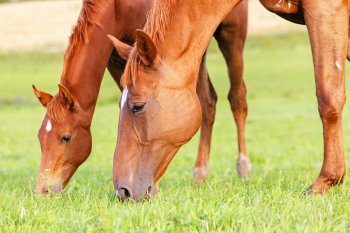 Learn how each part of the horse's digestive tract may contribute to horse colic. Then we will have a better understanding of how to actually solve the problem of colic not just treat the symptoms. On April 29th Part 3 By understanding the mechanics of the colon (Part 2), we have a better understanding how to treat the problem and not the symptoms. We will realize that the past ways to treat impaction colic, is not the right way. That is why Colic is the number one reason of deaths in horses. These methods have been used over the last 50 years. Did you ever think; when are they going to create something that works? It is rather emphatically stated the products do not contain probiotics.. Are probiotics bad for horses? It's in my horses feed! Hi Denise, Thank you for your comment - It is our opinion that Probioitics are great for horse's digestion. The reason we place Does Not Contain Probiotics - Is that probiotics assist in breaking down food stuffs slowly and gradually. This will possibly help with prevention on impaction colic. However, we are distinguishing ourselves from these type products. Our products are very unique in that they have a two part system that will bring fluids into the colon through OSMOSIS and then the second part ionic solutions assist in promoting smooth muscles to contract to assist with peristalsis to get the impaction moving through the digestive system. In your time of need - it's what you do first.